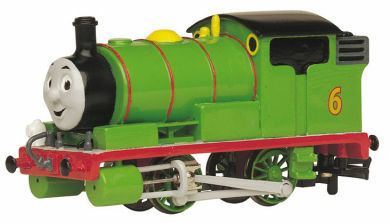 Percy is a chipper little saddle tank engine. He is a cheeky little engine who likes to shunt in the yards and pull the mail train. Percy is very good friends with Thomas, as he is one of the only engines who respects him. Percy was excited about the new fleet of diesels, but was very surprised to see how big they were. Much the same, he is good friends with all of them, especially Donald and Douglas. He is afraid of Warrior. Percy is based on a Great Western Railway #1340 "Trojan" 0-4-0ST with added coal bunker and Hunslet parts, circa 1897.